Fisher Price's latest Take-n-Play franchise, Color Change has returned to the Thomas & Friends range. The somewhat radical offering from the specialized die-cast toy line has appointed another two engines to front their own sets. 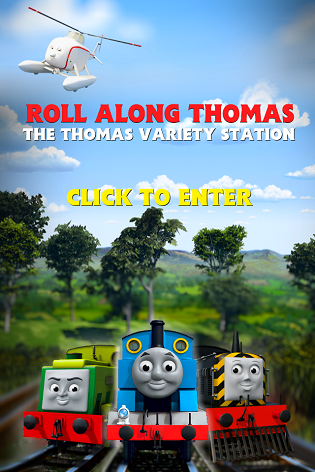 This comes after the debut colour changing release of the Thomas at the Ironworks play system. Distancing away from the core main eight characters of the television series, 'Arry, one half of the Ironworks Diesels, is incorporated in a storyline titled, Iron 'Arry's Oily Mess. While pulling a flatbed full of oil drums, the protagonist gets covered in the sticky liquid. Using a chunk sized tip to rub on his cab, 'Arry changes from "dirty" to "clean". Scruff also is brought out for a revisitation, as he too pulls a flatbed, albeit, in a yellow formation in Scruff's Dirty Mess. Take-n-Play Iron 'Arry's Oily Mess and Scruff's Dirty Mess from Fisher Price hit toy shelves worldwide soon. Thanks to SteamTeam for the alert.